"Most designers and creative agencies, no matter their industry niche, will do some nonprofit or cause-related work at some stage of their career," says veteran designer Peleg Top, "this work helps us create a sense of purpose that is bigger than us. It connects us to our community, helps us leave a legacy and be part of something bigger than our own work." And he should know: Peleg has dedicated the large part of his design career to working with clients and organizations that make a difference. A self-taught designer, Peleg Top founded Top Design from his garage at the age of 23 and grew it to be one of Los Angeles' most notable and sought after design firms specializing in cause related work. The Top Design team had a clear purpose: a mission to help organizations who do good achieve great success and effect change by providing them high-impact visual communication. For nearly two decades, Peleg and his creative team worked with all sizes of cause related organizations from small grass roots nonprofits to corporate giants. Some of his more prominent clients included Toyota, The National Academy of Recording Arts and Sciences (The GRAMMY'S), Steven Spielberg's Shoah Foundation, AIDS Healthcare Foundation, City of Hope Cancer Center and Tiger Woods Foundation. These days, Peleg brings his design experience and entrepreneurial spirit to helping other creative professionals improve their business development and marketing skills, become better leaders and live spiritually fulfilling lives. Peleg Top's unique blend of artistic and business sense has helped him become a leader in the creative community. He is a frequent speaker at national conferences, teaches business development workshops and leads business mastermind groups. As a curator of design excellence, Peleg is the author of Design for Special Events (Rockport Publishers) and Letterhead & Logo Design (Rockport Publishers). He is also the author of The Designer's Guide to Marketing and Pricing (HOW Books). Visit www.pelegtop.com and say hello. Every graphic designer strives to make an impact. Throughout his career, Jonathan Cleveland has also strived to make a difference. As founder and principal of Cleveland Design, an award-winning graphic design and communications firm in Boston, Jonathan is recognized both for his creative talent and his passionate belief in the power of design to drive positive social change. For more than two decades, Jonathan has balanced his work for commercial clients—from global corporations to small startups—with a deep personal commitment to nonprofit and cause marketing. 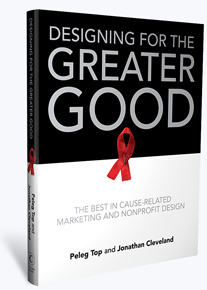 His belief that great design springs from smart strategic planning has made him a trusted advisor for leading companies in a range of industries, as well as numerous regional nonprofit organizations. Jonathan's work has made a difference for a wide range of organizations and causes, from promoting literacy and inspiring at-risk youth to driving support for AIDS research and education. He doesn't keep his passion for, and commitment to, important causes to himself. With a pro bono project nearly always underway, Jonathan inspires his colleagues at Cleveland Design to share in the uniquely satisfying challenge of designing for positive change. A member of the Cause Marketing Forum, Jonathan's work has been published in design books and recognized through national awards. Under his leadership, Cleveland Design was named one of the Top 20 Design Firms in New England by Boston Business Journal. "Creating innovative design for causes is very rewarding," Jonathan says. "One project can have a tremendous impact on the lives of so many people. Knowing you've helped others is a great feeling; it keeps you coming back for more."